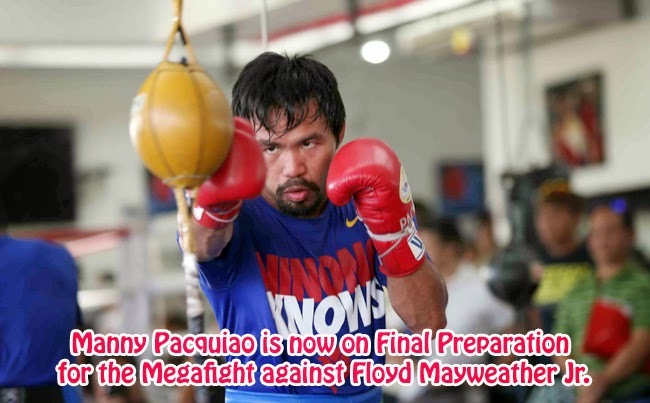 Home Boxing Floyd Mayweather Jr Manny Pacquiao Manny Pacquiao vs Floyd Mayweather Megafight 2015 News World News Manny Pacquiao is now on Final Preparation for the Megafight against Floyd Mayweather Jr.
Manny Pacquiao is now on Final Preparation for the Megafight against Floyd Mayweather Jr.
Manny Pacquiao is now on the final leg of his camp in preparation for the megafight against Floyd Mayweather Jr. In Las Vegas. On the final month before the biggest fight in Pacquiao’s career, he had locked down his final training in Los Angeles at Wild Card Gym. Pacquiao shared in an interview with Los Angeles Times that he plans to keep his focus on his welterweight unification fight against Mayweather and as part of it, the gym’s doors are locked before and after office hours starting on April 5, 2015. He also plans to stay away from the media interviews to keep his focus and will only provide an interview on April 15 as his media day. His long time trainer, Freddie Roach, also shared that too much media exposure on him and PacMan had put pressure on them and tooks its toll of the Filipino Boxing Icon. The trainer said that since the red carpet on March 11, they have done a lot of press interviews and it was in fact triple than their ordinary fight. He said that the fighter is tired and they are willing to give him a breather. Roach said that he can’t let Pacquiao get tired. LA Times reported that Pacquiao gives a much importance on mental preparation as the fight is expected to be historic in the boxing history drawing in high rate tickets as much as $10,000 and expected to break pay-per-view records. Pacquiao shared that he will only focus on boxing during the critical time of his training and his focus must not be interrupted. He cleared that the interviews had helpeed him promote his fight and share what is happening in the camp but he now needs to focus not only on his physical aspect but also his mental aspects.